As the wrestling world continues to celebrate the career of WWE Hall of Famer The Ultimate Warrior after his untimely passing this week, we’ve been thinking back to all the moments that the Warrior’s classic matches gave us. While many have pointed out that the Warrior was never a technical wrestler in the ring, the emotion created in his matches showed the ability he had to create epic moments that have and always will live on. Below we share our top 5 Ultimate Warrior matches, but feel free to join in and share your own as well. The Ultimate Warrior feuded with Rick Rude for the majority of 1989 over the Intercontinental title and after Warrior defeated Hulk Hogan for the then-WWF Championship at WrestleMania 6, Rude stepped up to the plate and was Warrior’s first PPV championship challenger. Warrior’s matches with Rude at WrestleMania 5 (where Warrior lost the Intercontinental Championship due to outside interference from Bobby Heenan) or the previous year’s Summerslam in 1989 (where Warrior regained the IC title) could’ve both also easily made this list as well, but the fact that Rude came across at Summerslam 90 as refocused and combined with his new short hair look gave the vibe that Rude was a serious threat to the title. To add a new element to their storied feud, this match would be held in a steel cage. I remember this version of Rude being more serious than ever and felt he could walk away with the title. It was not to be this night, as The Warrior successfully defended his title and Rick Rude left WWE just a few months later. 1992 was a year of transition; after many years of Hulk Hogan headlining nearly every WWE event, Hogan was finally taking time away from the company and The Ultimate Warrior returned at WrestleMania 8 to fill the main event void. Randy Savage had won the WWE Championship from Ric Flair at WrestleMania 8, and the stage was set for a dream rematch with one of his greatest rivals at Summerslam 92. I remember receiving an early copy of the WWF Magazine in the mail over the Summer of 92, and an ad for Summerslam 92 revealed to me for the first time what the main matches would be. I was absolutely blown away that not one but TWO “good guy vs. good guy” matches would headline the event, especially since nothing on TV seemed to hint at this. While it was a total shock, it also made total sense; after all, why shouldn’t two “good guys” face off if they were the top two guys in the rankings. What made this extra special was the fact that the two “good guys” involved had a major history together as Warrior and Savage had faced off just over a year prior in the legendary career vs. career match at WrestleMania 7; but this time they were on the same side and this time the title was on the line. The match had all the makings for another legendary encounter in the same vein not only as their WrestleMania 7 match, but also Warrior’s classic “good guy” match with Hulk Hogan at WrestleMania 6. Along the way this match lost a bit of its straight “good guys” match since Ric Flair’s “advisor” Mr. Perfect became involved in the story, as the word was he was secretly advising one of the two combatants which had many fans believing one of them would turn. In the end, interference from Flair and Perfect resulted in a countout win for Warrior although he and Savage walked out together in the end. It seems that this match is often overshadowed by the WrestleMania 7 match, but the different scenario leading in to this match along with the fact that it happened in front of 80,000+ UK fans made it an epic encounter on its own. Yet another Summerslam match comes in at number 3 on our countdown, and it was the Warrior’s first Summerslam appearance. Summerslam was a new PPV set to make it’s debut in Summer of 1988, and was set to feature and Intercontinental Title match between champion The Honky Tonk Man and Brutus “The Barber” Beefcake. The two had feuded for the IC belt since around WrestleMania 4 but Beefcake had been unable to capture the title; in the weeks leading up to the match, Beefcake had been attacked and injured by “Cowboy” Ron Bass, which left him unable to compete at Summerslam…this opened the door for a new challenger to the longest reigning Intercontinental Champion of all time. No new opponent had been announced for the Honky Tonk Man as he made his way to the ring in Madison Square Garden and proclaimed he would take on “anybody.” As the familiar “Ultimate Warrior” theme music hit, the Garden exploded as the Ultimate Warrior hit the ring as The Honky Tonk Man’s new challenger. The Warrior had been building momentum for about a year in WWE and seemed to be the right person at the right time, and the exact person the fans wanted to see. 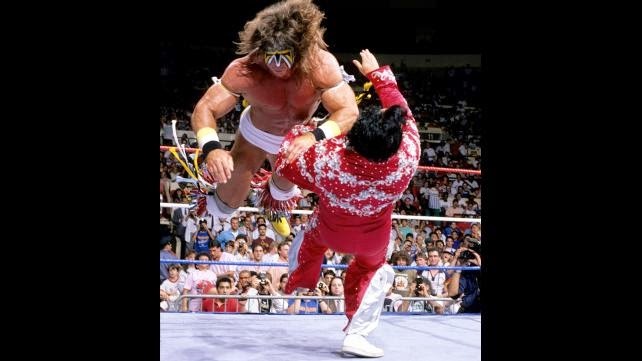 The Warrior waisted no time in launching his attack – clotheslines, body slams, and flying tackles immediately overwhelmed The Honky Tonk Man and after his signature big splash, The Ultimate Warrior was the new Intercontinental Champion in just 30 seconds! I remember watching this live on PPV and being shocked that we were seeing a new IC Champion for the first time in nearly a year and a half….and in 30 second no less! 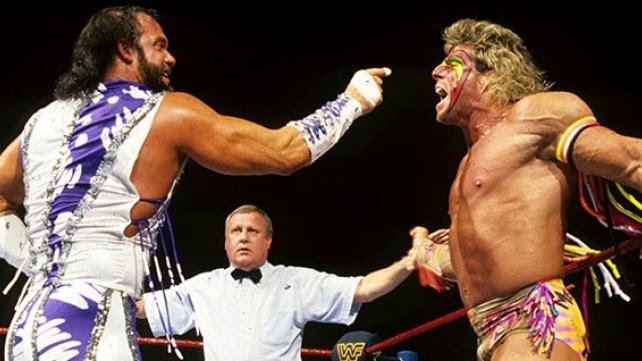 I believe this was the match that put The Ultimate Warrior on the map and laid the groundwork for him to ultimately become a main event WWE star. Number 2 and 1 on our list are almost completely interchangeable; these two matches are the two that will live on forever as the matches The Ultimate Warrior is always remembered best for. While this WrestleMania 7 match was not the main event, it is looked at by most as the match that made the show. This feud really ignited at Royal Rumble 91 when Savage interfered in The Warrior’s match with Sgt. Slaughter and caused him to lose the WWF Title; these were the days when long, drawn out, sensible stories were the norm so it made perfect sense that this WrestleMania 7 would be career vs. career. What I couldn’t fathom is one of the top 2 main event guys in the company for many years actually retiring after this; of course as we all know this didn’t stick as Savage would be back in action less than a year after losing this match. As far as the match itself, it was one of the first I can remember seeing multiple near falls, multiple finishing moves etc. before there was a winner. At one point when Warrior exited the ring and began to question if he could even beat Savage, I felt some sort of major change was going down, but in the end the Warrior returned and defeated Savage in the middle of the ring in what could be considered Warrior’s greatest match in-ring wise. The aftermath with Savage reuniting with Elizabeth may overshadow everything a bit as far as Warrior goes, which is why we chose the next match as number 1. Finally, the most epic Ultimate Warrior match ever – his showdown with WWF Champion Hulk Hogan at WrestleMania 6. This really was a dream situation as a kid; the top two “good guys” in the company facing off in a straight up competitive match with no interference or crazy story involved. At the 1990 Royal Rumble, the shocking moment that left Hogan and Warrior in the ring facing off was something that you always wished would happen in a rumble – two guys that you could NEVER imagine going against each other, but having to due to the Rumble situation. Those 30 or so seconds in the Rumble of Hogan vs. Warrior were electric, but little did we know that it was a precursor to something much bigger. 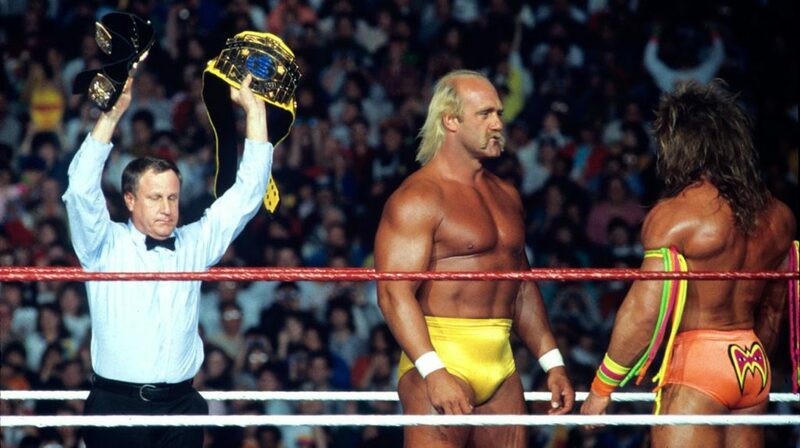 WWF President Jack Tunney made the announcement that Intercontinental Champion The Ultimate Warrior would challenge WWF Champion Hulk Hogan at WrestleMania 6, and not only that but BOTH championships would be on the line. It was beyond comprehension – nothing like this had headlined a PPV before, and I don’t believe Hogan had even defended his title against another “good guy” during any of his reigns since 1984. The Warrior represented a new generation, and it felt like nothing could ever be bigger than this match. When April 1, 1990 had arrived, the hype was at an all time high. 60,000+ fans packed the Toronto Skydome to see the match that would see the proverbial “torch” passed from Hulk Hogan to The Ultimate Warrior. Some may have worried at the time about two guys like Hogan and Warrior pulling off a main event level match since neither were looked at as “technical” guys in the ring, but the match delivered on all fronts and gave us the emotion needed to make it the classic it was. The Ultimate Warrior pinned Hulk Hogan after a big splash, clean in the middle of the ring…something I hadn’t seen in my years of being a fan at the time. If Hulk ever lost it was always a screwy situation, and even then that had very rarely happened. Warrior beating Hogan for the WWF Champion was a clear signal that a new era had arrived, and I wasn’t even sure Hulk would return following this loss. 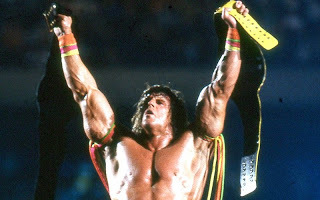 The moment Hulk handed over his belt to Warrior and the two embracing in the center of the ring was an image that will always be a part of WrestleMania history, a moment the likes of which are rarely seen if ever these days. The Ultimate Warrior was elevated to the next level at WrestleMania 6, and it was this day that officially made him a main event star and legend. The match, the emotion, the history, all reasons we chose Hulk Hogan vs. The Ultimate Warrior as the Warrior’s most epic match of all time.